Unifor and CN, in cooperation with registered charity Indspire, have established a scholarship and bursary program for Indigenous students, with the goal of advancing the academic outcomes of Indigenous post-secondary students across Canada. The union and the railway will each contribute $125,000 to the program, with matching funds from the Federal Government of $230,000. Including an emergency fund of $20,000 funded by Unifor and CN, that's a total of $480,000. The contribution was presented at Unifor's Ontario Regional Council at the Sheraton Centre in Toronto. "Unifor is a social union, committed to helping make Canada a better place for all people. Issues such as Indigenous education and opportunities for Indigenous people are central to that goal," Unifor National President Jerry Dias said. Drew Redden, CN's Lead of Community Affairs in Ontario, said: "CN is pleased to partner with Unifor and the federal government to help advance Indspire's mission of investing in Aboriginal people across our country. We commend Indspire for all its work towards the goal of closing the gap in Aboriginal education, and here at CN, we welcome the opportunity to play a role in advancing that work." 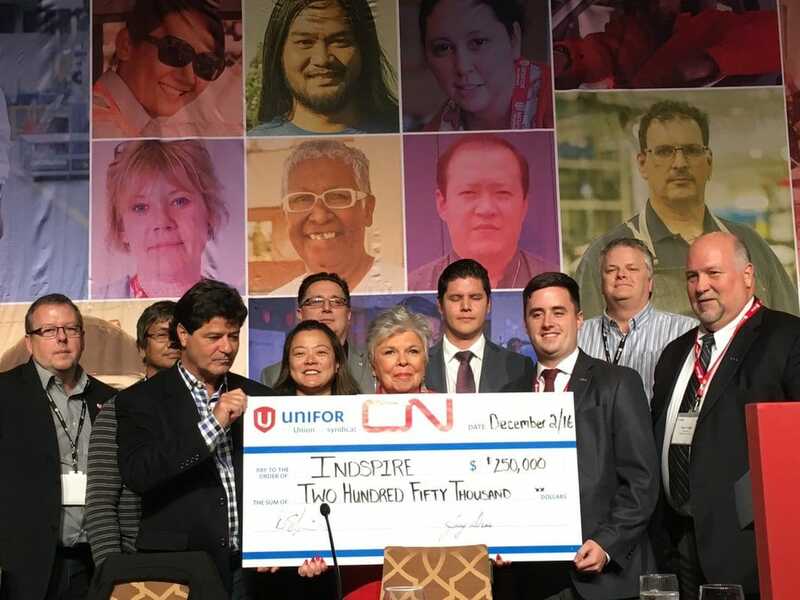 Unifor and CN present Roberta Jamieson, President and CEO of Indspire, a cheque in the amount of $250,000 at the December 2016 Unifor Ontario Council. Unifor Council 4000 Regional Representatives Wesley Gajda and Mark Robinson are in the back of this photo. Unifor represents approximately 4,000 CN employees. The contribution to Indspire's Building Brighter Futures: Bursaries and Scholarship Program comes out of contract talks last year between Unifor and CN, which included a provision for a jointly run fund that would focus on women and aboriginal causes. "The generous contribution of Unifor and CN will help Indigenous students overcome many of the barriers they face as they pursue post-secondary studies, especially lack of financial resources," said Roberta Jamieson, President and CEO of Indspire. Indspire's program will use the money to provide bursaries of $2,500 to about 190 Indigenous students over the next two years. Students will come from a range of backgrounds, including those studying trades, those with disabilities, those who are studying part-time, those who may be parents or caregivers, and those wishing to upgrade their academic credentials. The bursaries will be awarded equally among male and female applicants. Unifor's donation will come from its Social Justice Fund. There will also be an emergency fund of $20,000 to help students, who often must seek education outside their communities, address unexpected costs involved with their education – such as family or personal emergencies. ​Unifor is Canada's largest union in the private sector, representing more than 310,000 workers. CN transports more than $250 billion worth of goods annually for a wide range of business sectors, from resource products to manufactured products to consumer goods, across a rail network of approximately 20,000 route-miles spanning Canada and mid-America.